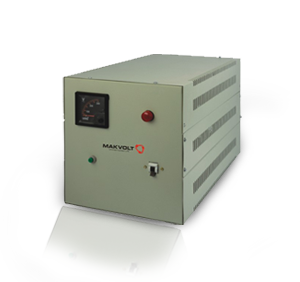 Makvolt Power Constant Voltage Transformers (CVTs) are AC Voltage Stabilizers providing steady voltage to electrical equipment/instruments and protecting them from the harmful effects of under-voltage and over-voltage. Makvolt ferroresonant CVTs are the ideal maintenance free solutions for loads that can suffer erratic operation or be damaged by electrical noise (common and series mode) local transients, mains power sags, surges and brownouts. No Semiconductor or moving part used, hence very high reliability. Intrinsic current limiting and short current protection. Energy storage for line loss up to main 3ms at typical load. Short term over load capacity.